Eggs are a great gluten-free food. They are easy to prepare, nutritious, inexpensive, commonly available, and their natural packaging completely eliminates gluten. Eggs are mostly protein, compared to gluten-containing foods such as wheat or barley, which is carbohydrate, especially when highly refined. Eggs have their pros and cons. Eggs are convenient and nutritious. On the other hand, egg allergy problems are relatively common. Don’t let this put you off, but avoid becoming dependent on eggs as part of your daily diet. There are as many type of eggs as there are birds. Of course only a small fraction of egg types are commercially available. This till provides many options. The most common type of egg in the Western world is the chicken egg. There are many chicken varieties, resulting in a wide variety of chicken egg types. The most common type of chicken egg is white. You can usually get brown eggs as well. These are considered to be stronger than white eggs. Chicken eggs vary widely in taste, colour and yolk strength. This has a lot to do with how the hens are fed and the quality of life they lead. The worst kind of egg are from big, inhumane factories. This is the kind of egg found in supermarkets. If you are very lucky, you can find free-range eggs raised in small numbers by local farmers. Truly free-range eggs (well, actually its the hen that has free range, not the egg) have the best taste and the strongest yolks. Eggs labeled as free-range can often be found in health food stores. They are not exactly from a farm with a half-dozen chickens pecking around the farm yard as the illustrations would have you believe. But they are better than the largest operations that supply supermarkets. 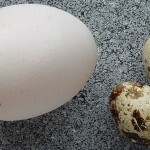 Quail’s eggs are about one third the size of hen’s eggs. While you may find them in some supermarkets, they are more usually found in specialty shops. If you are allergic to hen’s eggs, you may be able to eat quail’s eggs. Duck eggs are bigger than hen’s eggs. They have a higher oil content than hen’s eggs, but don’t let this put you off. The oil is of high quality, compared to deep-fried potato chips for example. They have a rich flavour and are excellent for baking. They may take getting used to in plain cooking such as hard boiled or omelets. The whites are not so good for meringues. Duck eggs should be washed and it is recommended to cook them for at least 10 minutes. Try duck eggs if you are allergic to hen’s eggs. Goose eggs are twice the size of hen’s eggs. They are somewhere between hen’s eggs and duck eggs in flavour. They are good for baking and plain cooking. Like duck eggs, goose eggs should be washed and it is recommended to cook them for at least 10 minutes.